Note: Gerry Adams will be giving a public talk in the Civil Rights Room of the Nashville Public Library on Saturday, November 3rd at 10:00am. The talk is open to the public and Gerry invites you to come say hello! For more information, contact Greg O’Loughlin at 615-887-7547 or oloughlin@gmail.com. Gerry Adams has dedicated most of his life to finding an end to the conflict that has engulfed Northern Ireland since his youth. As the President of Sinn Féin, he played a crucial role in facilitating the Good Friday Agreement of 1998, which brought about an end to a three decade-long period of violence known as “The Troubles.” In doing so, he built connections with civil rights leaders from around the world, including Rosa Parks and Nelson Mandela, and learned some valuable lessons about the humanity that connects all people regardless of their race, religion or national origins. 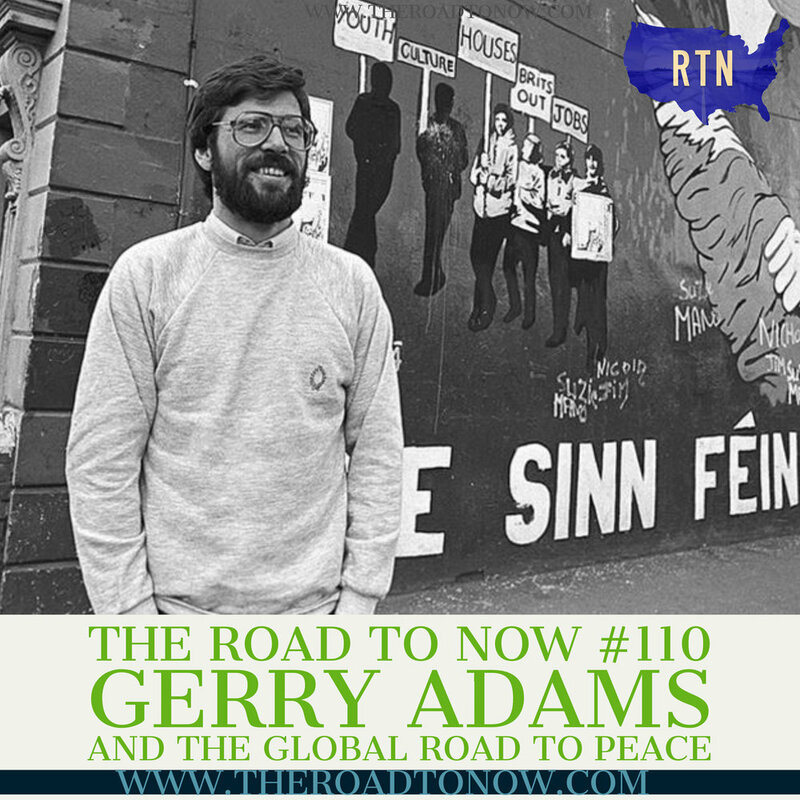 In this episode of The Road to Now, Gerry shares his story of struggle and how he found a road to peace at a time when few believed it was possible. Also joining us on today’s episode is Ben’s friend and colleague, Dr. Mark Doyle, who was kind enough to join us to help explain the history of Northern Ireland and why Gerry Adams was such a crucial figure in that country’s history. Mark specializes in Irish history at Middle Tennessee State. His most recent book, Communal Violence in the British Empire: Disturbing the Pax (Bloomsbury, 2016) was joint winner of the 2017 Stansky Book Prize for the best book on British Studies since 1800. His current project is a history of the Kinks entitled The Kinks: Songs of the Semi-Detached (forthcoming). You can follow Mark on twitter at @DrMarkDoyle. To learn more about Gerry Adams, pick up his autobiography, Before the Dawn. His new book of recipes, The Negotiators Cookbook, is out soon, and you’ll know why it’s worth picking up when you listen to the episode! You can also follow Gerry on twitter at @GerryAdamsSF. A special thanks goes to Greg O’Loughlin for putting us in touch with Gerry and facilitating this interview! The Road to Now is part of the Osiris Podcast Network.